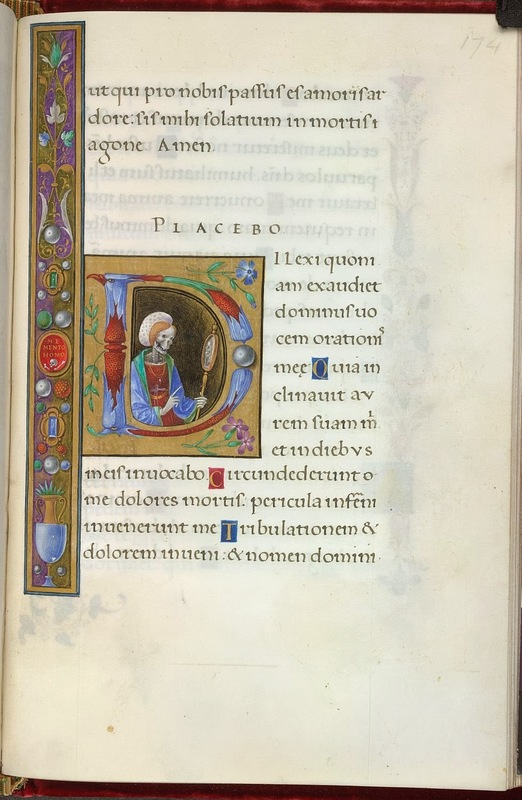 Historiated initial 'D'(ilexi) of a woman (Duchess Dionora?) 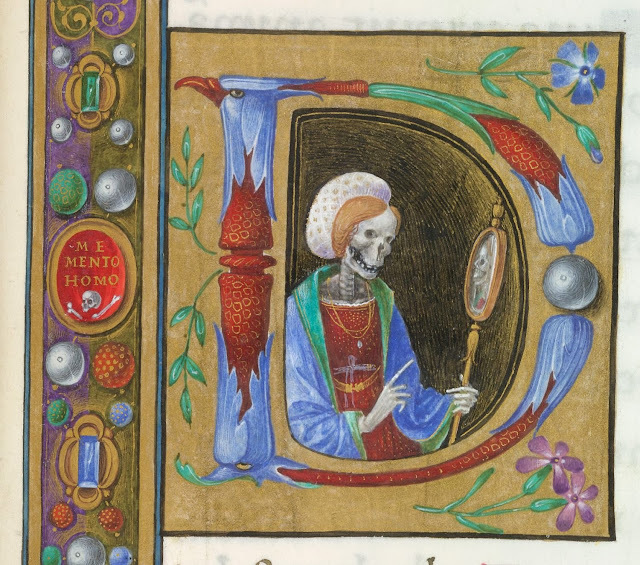 with a skull for a face admiring herself in a hand mirror, and a partial scatter border with gems, flowers, and vases, at the beginning of the Office of the Dead. Matteo da Milano was one of the most important Italian illuminators working in the late-fifteenth and early-sixteenth centuries. Originally from Milan, Matteo worked largely in Rome and Ferrara. Death is gazing on her reflection in the looking glass. It is an invitation to reflect upon death as the gateway to eternal life. It is one of a double portrait. Her husband`s is the other and hangs also in the Uffizi. 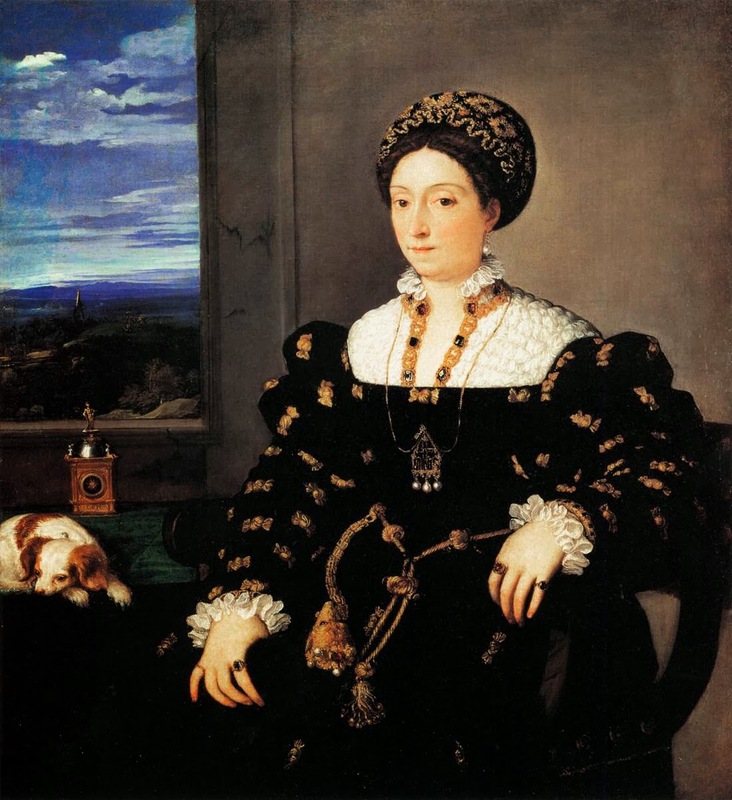 The Duchess was buried in the Church of Santa Chiara in Urbino, Italy. There seems at present to be a rather strange and unholy fashionable practice in certain Italian academic circles to examine the remains of the dead, purportedly for "scientific" purposes. Unfortunately the Duchess has not been immune from this rather bizarre and unhealthy practice. "The word which early Christians gave to the place for the burial or entombment of the dead, cemetery, comes from the Greek word for dormitory. It expresses the belief of the Christian that the bodies of the dead rest in their place of burial or entombment until the resurrection of the body on the Last Day. Like the Christian grave or tomb, the Catholic cemetery is sacred and is to be maintained accordingly. "